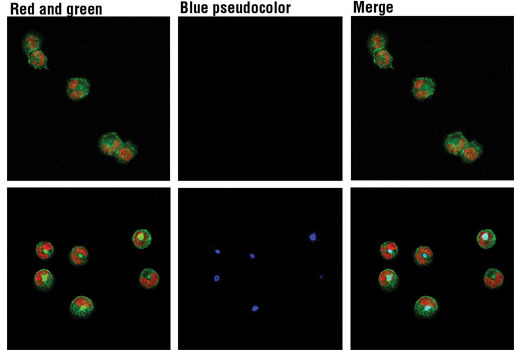 Confocal immunofluorescent analysis of THP-1 cells, treated with TPA #4174 (80 nM, 16 hr) (top) or treated with TPA followed by LPS (1 μg/ml, 1 hr) (bottom), using TNF-α (D1G2) Rabbit mAb (Alexa Fluor® 647 Conjugate) (IF/Flow Preferred) (pseudocolor blue). Actin filaments were labeled with Alexa Fluor® 488 phalloidin (Green). Red = Propidium Iodide #4087 (PI)/RNase Staining Solution. Panel shows red/green only (top and bottom left), pseudocolor blue only (top and bottom middle), or merged RGB (top and bottom right). 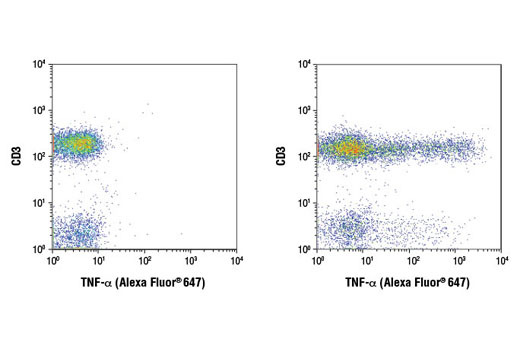 TNF-α (D1G2) Rabbit mAb (Alexa Fluor® 647 Conjugate) recognizes endogenous levels of total TNF-α protein. Monoclonal antibody is produced by immunizing animals with recombinant human TNF-α protein.